M. A. R. Habib received his doctorate from the University of Oxford. He is the author of seven books, including the highly acclaimed A History of Literary Criticism: From Plato to the Present (2005) and Modern Literary Criticism and Theory (2008). A book of his poetry, Shades of Islam: Poems for a New Century, will appear in September 2010. 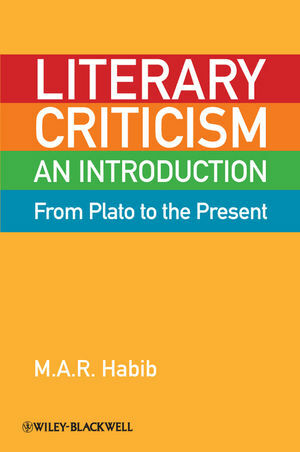 Part I Classical Literary Criticism and Rhetoric. Introduction to the Classical Period. 2 The Traditions of Rhetoric. The Subsequent History of Rhetoric: An Overview. 3 Greek and Latin Criticism During the Roman Empire. Part II The Medieval Era. 4 The Early Middle Ages. 5 The Later Middle Ages. Intellectual Currents of the Later Middle Ages. The Traditions of Medieval Criticism. Part III The Early Modern Period to the Enlightenment. 6 The Early Modern Period. Poetics and the Defense of Poetry. Enlightenment Literary Criticism: Language, Taste, and Imagination. 9 The Aesthetics of Kant and Hegel. Part IV Romanticism and the Later Nineteenth Century. 11 Realism, Naturalism, Symbolism, and Aestheticism. Historical Background: The Later Nineteenth Century. Part V The Twentieth Century: A Brief Introduction. 13 From Liberal Humanism to Formalism. The Poetics of Modernism: W. B. Yeats, Ezra Pound, and T. S. Eliot. 14 Socially Conscious Criticism of the Earlier Twentieth Century. Early Feminist Criticism: Simone de Beauvoir and Virginia Woolf. 16 The Era of Poststructuralism (I): Later Marxism, Psychoanalysis, Deconstruction. 17 The Era of Poststructuralism (II): Postmodernism, Modern Feminism, Gender Studies. 18 The Later Twentieth Century: New Historicism, Reader-Response Theory, Postcolonial Criticism, Cultural Studies. Epilogue New Directions: Looking Back, Looking Forward.